Occasionally we may offer you special promotion or discounts on our website. These are called Ecoupons. How do I use an Ecoupon? If you would like to claim a special offer or discount, all you need to do is click on the banner or text link. You will be automatically taken to an Ecoupon page and the offer will be applied to your basket. Please note that after you have confirmed and placed your order, we are unable to apply an Ecoupon. Can I use more than one Ecoupon on an order? You can only claim one E-coupon per order. 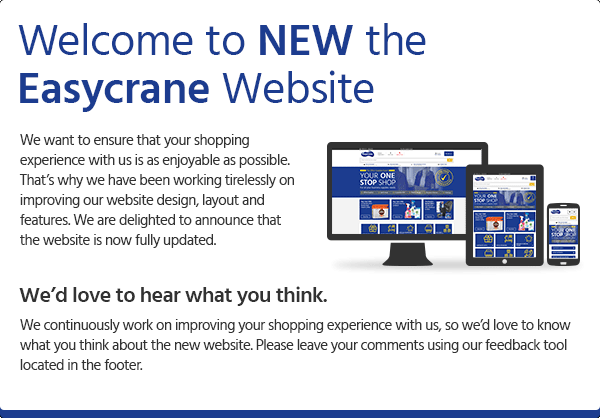 You will need to log into your Easycrane Ltd account or register as a new customer before you place an order using an Ecoupon. Register or login now. The Ecoupon you entered may have expired. Please check the offer’s terms and conditions for more details. You may not have reached the minimum purchase requirement to use the Ecoupon so it may not show on your order. The offer applies to your subtotal before VAT and any delivery charges. Some items may not be included in the offer. Please refer to our Terms and Conditions for more details. If you need assistance at any time, you can contact us online or call 0808 169 6971, Monday to Friday, 9:00am – 5:30pm.